Looking for a fabulous, easy treat? How about a little caramelly goodness sandwiched between rich chocolate and a little salty crunch? I’ve got you covered with these rolo pretzel bites. They whip up in just minutes and are perfect for munching during a movie, long car ride or on a weekend getaway. They are also HIGHLY addictive. I’d recommend making a double batch. I made the epic mistake of bringing just a single batch to a family camping trip and they were devoured the first evening. I’m embarrassed to tell you how many I shoved in my face. I could not stop. They were just glorious. Simply top waffle pretzels with an unwrapped Rolo candy. I used slave labor and had my kids unwrap all the candies. They love helping me. 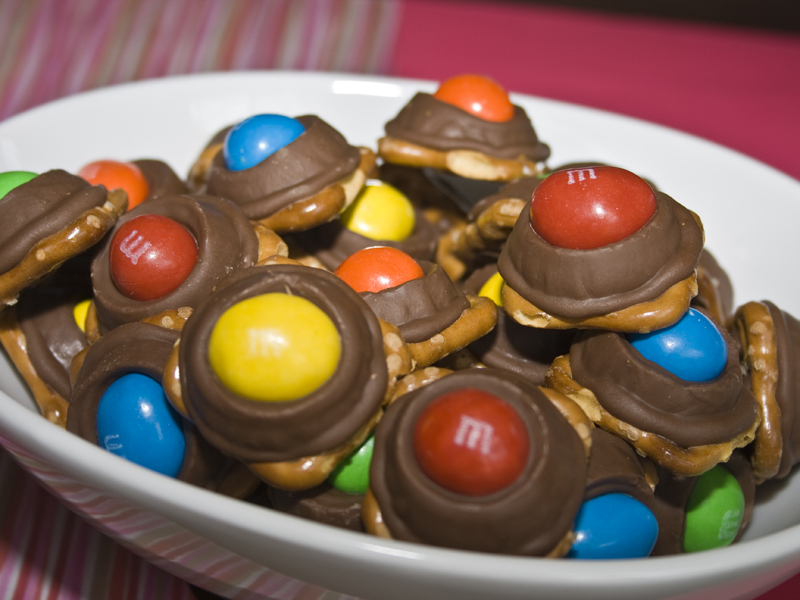 Bake for a couple of minutes and then press a peanut M&M into the Rolo – smooshing it down into the pretzel. You could use a regular M&M, but I like the peanut crunch on top. This recipe is proof that if Mars & Hershey combined, they could take over the world. You won’t be able to stop eating these. There are lots of combinations you could do with these little bites. During the holidays, use just red/green M&Ms. You could use Hershey’s kisses or hugs instead of Rolos (but why on earth would you want to remove the caramel from this recipe?). 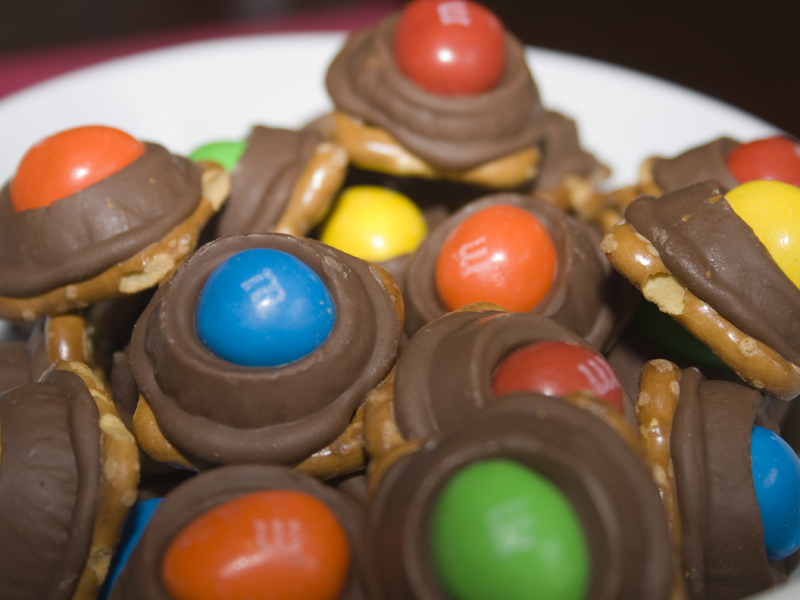 All you peanut butter/chocolate combo folks could press a peanut butter M&M on top to get your fix. Personally, I think these are perfection just as they are. 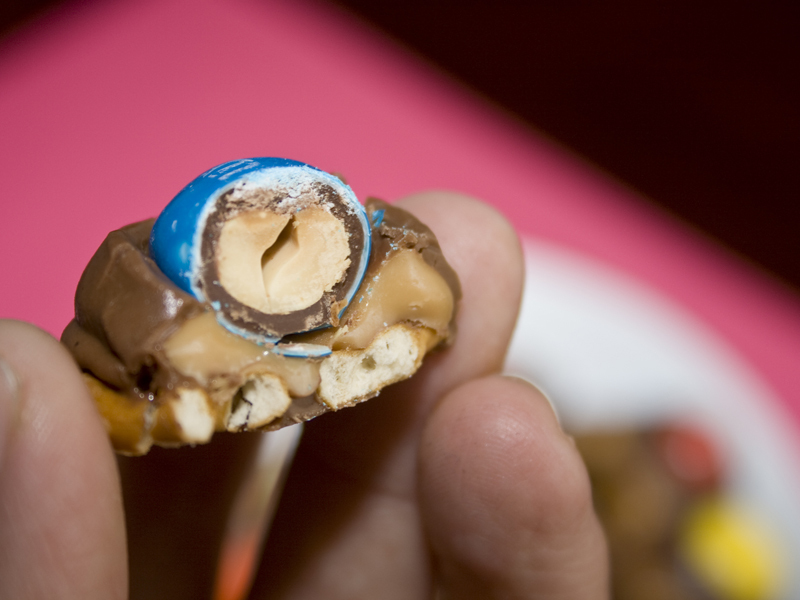 Gooey caramel, salty pretzel and just the right amount of chocolate with a peanut crunch. Oh. Baby. On a large parchment paper lined baking sheet, spread out pretzels in a single layer. 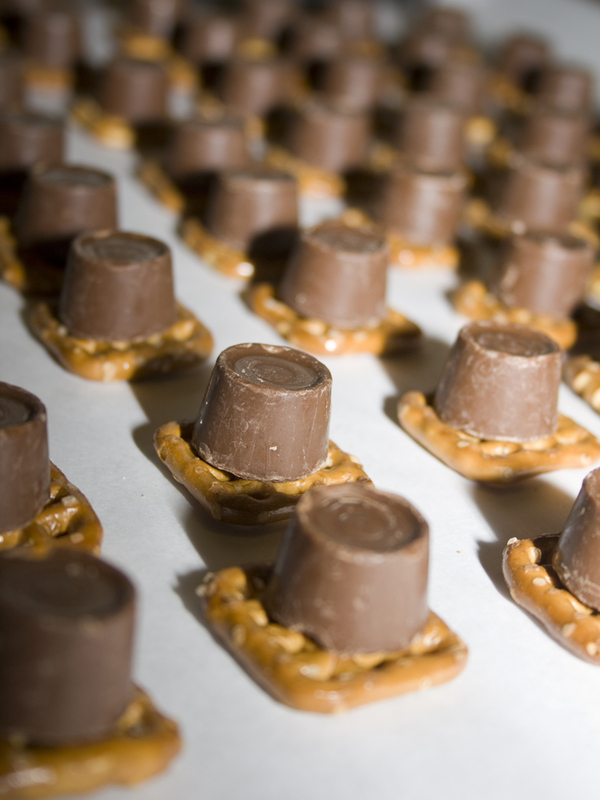 Unwrap Rolo candies and place one on top of each pretzel. Bake at 275° F for 2-3 minutes until Rolo candies are soft. 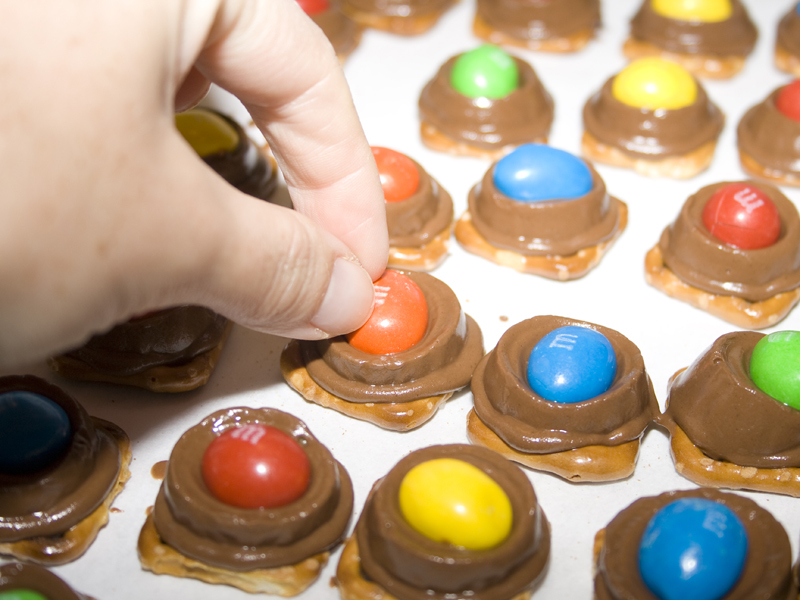 Remove from oven and quickly press one M&M into each Rolo.